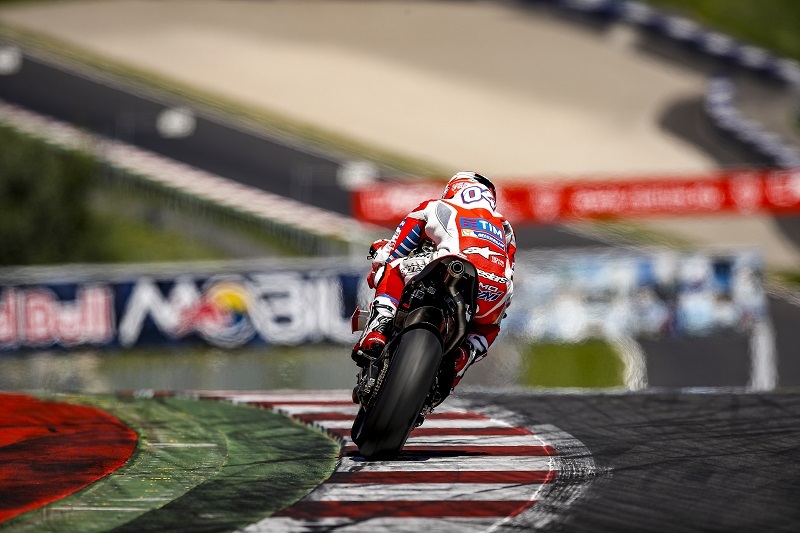 Two days of private MotoGP testing organized by Ducati at the Red Bull Ring circuit in Zeltweg, in view of the next round of the championship – the Austrian GP on August 14th – have concluded successfully for the Ducati Team. A total of 21 riders and test-riders from all the manufacturers involved in the championship were present to get a first look at the renovated Austrian circuit. Both yesterday and today the Ducati Team riders were the quickest men out on track, and this evening the final standings saw Andrea Iannone top the times ahead of Andrea Dovizioso, with two-time world champion Casey Stoner, present as the team’s test-rider, in third place. During the second day Michele Pirro, the official tester for the Ducati Team, also went out on track for a few laps. Iannone was the quickest man on track, with a best time of 1’23.240, followed four-tenths behind by Dovizioso in 1’23.680. Despite a crash at Turn 6 five minutes from the end, Stoner was classified in third place, with a best lap of 1’23.865. The MotoGP teams and riders will be back again at the Zeltweg circuit in twenty days’ time for the tenth round of the world championship. i would like to start producing two cylinder motobike in sri lanka. please help me.